We have a fridge problem. No matter what temperature we put it on, in the winter, the fridge frosts up. In the summer, this then defrosts, leaving us with a constant puddle of water at the bottom of the fridge. Not pleasant. 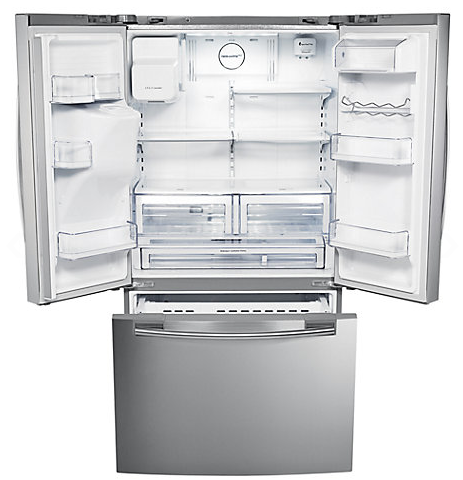 One of the things that we need to organise over the summer, therefore, is a new fridge. The bigger purchases we deliberate over for some time, weighing up the pros and cons. 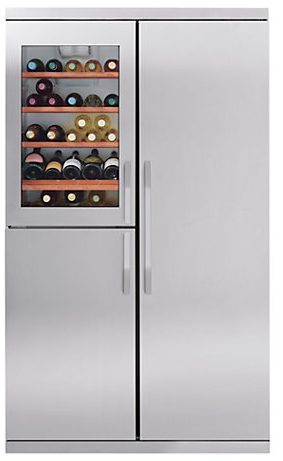 My ultimate desire would be for one of these, the 'John Lewis JLWFF1104 Wine Cooler Fridge Freezer'. Another like is the Samsung 3 door fridge freezer. 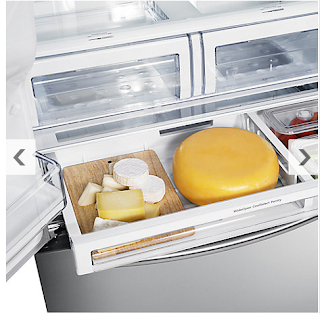 I love that it has a little integrated drawer JUST FOR CHEESE! However, I suspect that the bottom door is a sliding one and that getting into the freezer might be a bit of a pain. At £1679, I'd hope it was a little closer to perfection. Again, the width thing is likely to be an issue here. I'm also quite tempted by a Miele, despite the higher price-tag. I love our 6220 vacuum cleaner from them - I have been known to tweet about it a few times. It's so very reliable and GOOD at picking up everything. So, to the cheaper and thinner end of the wedge. 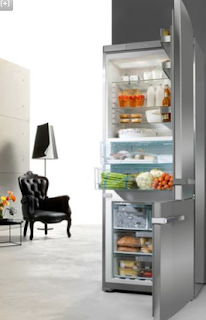 Miele offer the KD12823s at £699 but unsurprisingly, it just isn't as stylish as the top end. I have no doubt that it still carries the reliability of a Miele though, so it is definitely one to consider when we finally get around to making a decision. Another that I can't help but add to the 'maybe' pile is the range of fridge freezers made by Gorenje. I know nothing about the company but the range of colours it comes in makes me want to collect them all! My favourite is possibly the RF60309OR, costing £700, or the coffee version which is slightly more expensive. The latter is probably slightly better placed in our kitchen of greens and greys. 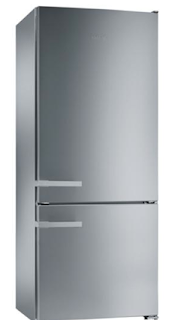 The husband is rather keen on the Samsung G Series - what's good about them is 'Eco-space', which through wizardry (slightly thinner walls) provides more space inside than other fridge freezers. A decent option from this range is the RL58GPEIH. At £612, it's still a little pricey but I suspect we might need to step up the price of the appliance we buy - the wonderful vacuum cleaner is testament to that. If we do ultimately decide to go for the cheaper, shorter term investment, I guess we might go with a Beko CFD5834AP. For a budget fridge freezer, it has the water dispenser that makes it look just a little more stylish. The reviews seem to be rather positive and the fact that it claims to be safe for thirteen hours if there is a powercut. 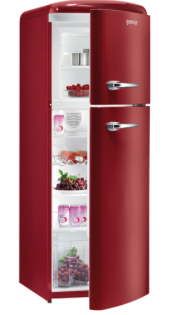 So - fridge freezers - any thoughts? Which would you go for given the choice? What purchase are you holding off on while you try to weigh up a multitude of choices?